“I have spent the morning trying to draw a cartoon of a black person without it being racist. It’s bloody difficult. Especially the lips. Make them too big and anti-racist people will accuse you of being a white supremacist peddling, in their words, the old ‘sambo’ myth. But too small and they don’t look like the lips of very many black people. It’s the same with the colour. At first, on my cartoon, I used a black felt-tip pen and so the figure came out very black indeed. ‘Sambo’ territory again, especially when I added big red lips and very white teeth. In the end I used cross-hatching with a pencil but this was, to my mind, unsatisfactory. The job of a cartoonist is to exaggerate physical characteristics into an immediately recognisable caricature for comic effect, not to assuage people with skin as thin as the surface tension of water. My little drawing was the consequence of the furore which enveloped an Australian cartoonist, Mark Knight, who works for the Melbourne Herald Sun. 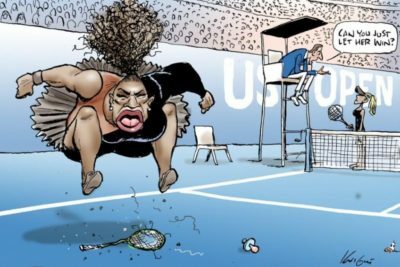 He had produced a very funny cartoon of the perhaps inaptly named tennis player Serena Williams. …..there is almost certainly a government-funded body somewhere which has done a study of cartoons and found that black people are under-represented in them and that newspaper and magazine editors should perhaps apply a quota to ‘reflect in all line drawings and illustrations the vibrant diversity of modern Britain’ but adding the rider that caricatures of black and ethnic minority people should ‘in so far as is possible reflect the positive contributions these people have brought to our society’. It is a fraught area, then. Read the whole thing if you can, I’ve left half the good bits out.